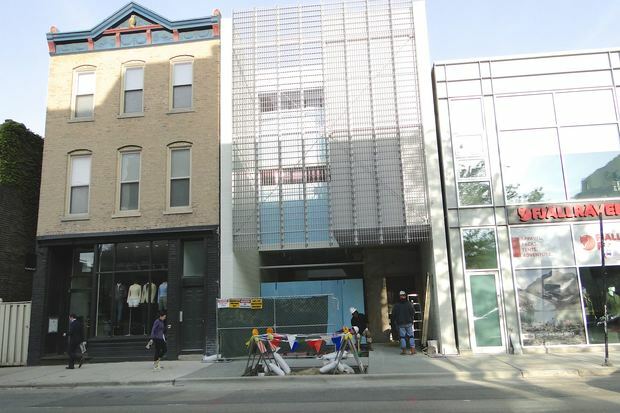 WICKER PARK — An aluminum and glass storefront that has been shrouded in mystery since work on it began in November is getting closer to completion, much to the relief of walkers unable to use its closed-off sidewalk in front for several months. "I'm glad the sidewalk is back. I would either cross the street and walk on the other side of Damen or walk in the bike lane, which I don't like doing," said Kelly Skrodzki, a Ukrainian Village resident who goes on long, early-morning power walks. 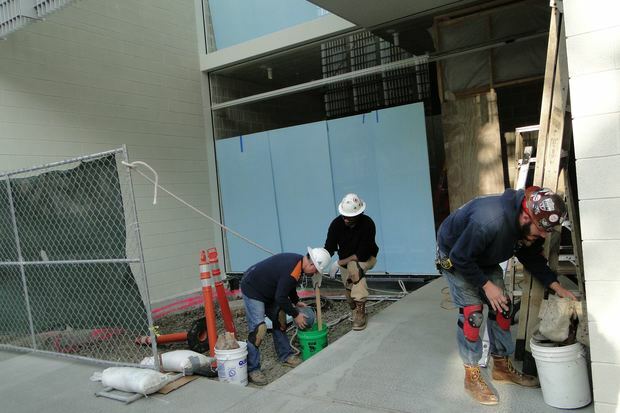 Workers at neighboring shops also heralded the return of the sidewalk, which was fully restored Thursday. "We are excited that people will be able to walk by our window and see us a bit more clearly. It coincides with good weather and opening of the 606" trail and parks project, said Nina Flesinger, a sales associate at Fjallraven, an outdoor apparel store at 1708 N. Damen Ave. that opened in February. Ald. Scott Waguespak (32nd) said Thursday that his office has not been told which retailer will be occupying the building. Waguespack said that no sign permit or business license had been applied for yet with the city. 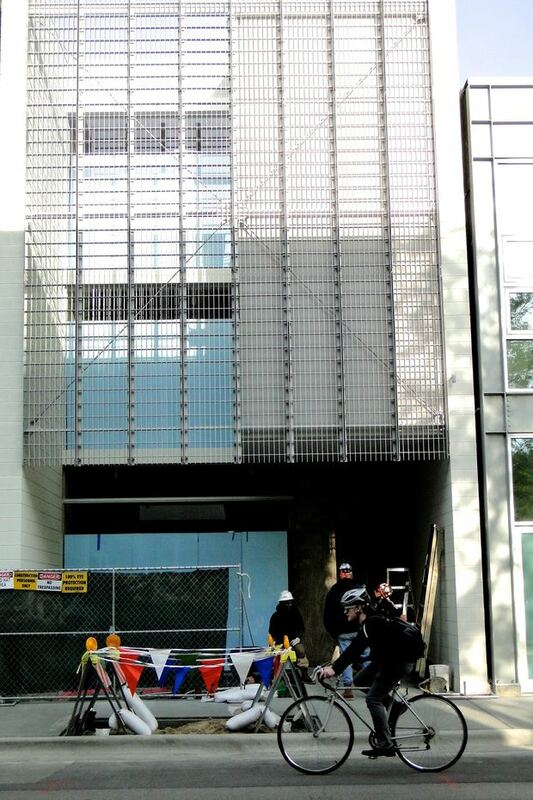 Months earlier, Paul Sajovec, a spokesman for Waguespack, said it is rare for a project to be so far along without anyone knowing what's moving into the building. Based on the zoning assigned to the project, which was issued a $2.3 million building permit in the fall, it will definitely be a retail tenant. 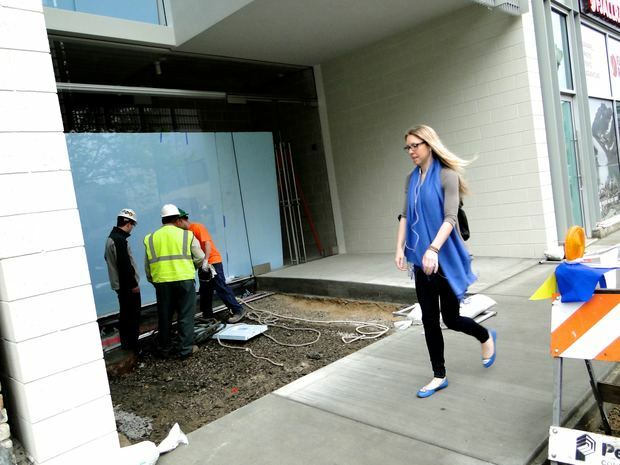 Since the building has been outfitted with fiber cables for high-speed Internet, and there are several electrical outlets inside, there has been speculating that it could be a high-tech store. A permit for an elevator, which will make stops on three floors, was issued in January. Don Glisovich, the building's owner and a prolific local real estate developer, has declined to discuss the tenant. The new development replaces a one-story, 24-hour Clarke's Diner, which closed in 2013 and was demolished over the summer. Sajovec said that Glisovich is not required to disclose his tenant to the city and previously joked that "as long as it's not another shoe store, I think people would be cool with it." The renderings for the new three-story building at 1704 N. Damen Ave. by architect Elissa Frances Scarfano show a masonry and glass storefront behind an aluminum screen, with a courtyard in the entrance. Workers from a suburban tree company were delivering trees to the site around 7 a.m. Friday. A serviceberry tree, which can grow between 10 and 25 feet tall, will be planted in the building's courtyard next to the front door, while a honey locust tree will be planted in the public parkway in front of the building. The worker said if all goes as planned, both trees will be planted by noon Friday.